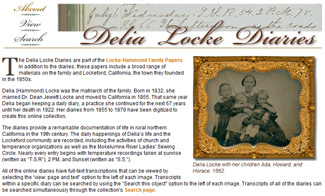 When Delia Locke and her husband moved to northern California in 1855, she started a diary that she continued to write in until her death in 1922. Thanks to the University of the Pacific, her diary entries between 1855 and 1879 are available online. Locke not only recorded detailed observations about daily life, but she also commented on major political events. Abraham Lincoln’s victory in the 1860 election was “good news,” as Locke noted on November 16, 1860. Four years later she still supported Lincoln. Even though she could not vote, she had strong opinions about the candidates. While Lincoln “[was] the representative of freedom,” Locke believed that Democrat George McClellan represented “slavery” and led a political “party which [was] composed of traitors at heart.” The University of the Pacific also has other interesting digital projects to explore, including “John Muir Journals,” John Muir Photographs, and several collections related to Japanese-American Internment Camps. Thanks for this article. Tweeted it.